Lyme disease is transmitted from ticks to your dog (and potentially you) through a bite from an infected bug. Ticks are a common occurrence in Manitoba, and can be picked up by your dog almost anywhere! Last year there were 577 diagnosed cases of Lyme disease in Winnipeg dogs. Ticks are unable to fly or jump, so they lay in wait on long blades of grass (almost like a silent ninja!) for your dog to rub up against and then attach themselves to the host. It is very important to make sure you check your dog thoroughly after they have been outside in long grass for any ticks that may have latched on. Ticks enjoy hanging out in certain “hot spots” on your dog, such as right inside their ears, in their armpit area and on their chests. When removing a tick from your dog, make sure that you have a couple of things handy and ready to go beforehand: tweezers and a container filled with alcohol or peroxide to put the ticks in. Grasp the tick close to the skin with tweezers and pull slowly upward with steady pressure. Try to avoid twisting or crushing the tick and make sure that you don’t accidentally leave the head still attached to your dog. 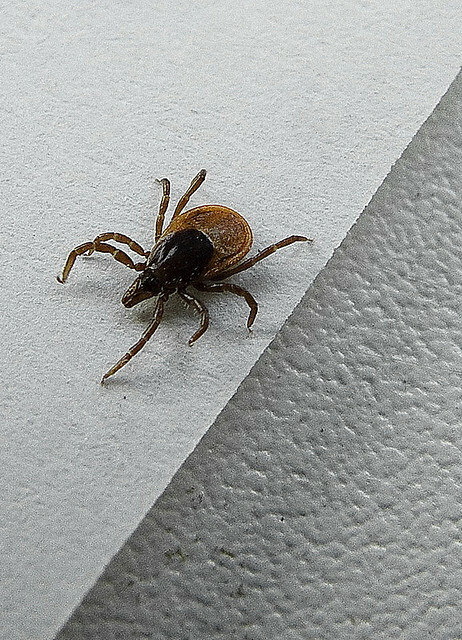 After the tick has been removed, cleanse the skin around the tick bite with soap/water or disinfectant. If the bite starts to scab over and your dog is uncomfortable, you can break open a Vitamin E tablet (purchased at any pharmacy or health store) and rub the liquid on the wound site. Many pet owners will take to the internet to do research regarding Lyme disease in dogs, but won’t find a lot of literature that doesn’t focus on what the disease does in humans. The symptoms in dogs are quite different. For example, it is rare that a dog will develop the heart and neurological issues that Lyme disease causes for humans. Common symptoms include joint pain and fever, which won’t normally present until 2-5 months after the initial bite. Dogs with Lyme disease will sometimes exhibit lameness. Their joints may swell, causing tenderness and limping. Sometimes it is constant, sometimes it will go away and come back. Other symptoms a dog may have the disease are swollen lymph nodes, walking stiff with an arched back, lethargy, being sensitive to touch, having difficulty breathing, and depression. Lyme-positive dogs can also develop kidney issues in the later stages of infection. While many dogs live with this disease undetected, it is best to take your dog to the vet if you think they may be infected. Your vet will start your dog on a course of antibiotics to clear the disease from his body. Tick control is essential to the prevention of Lyme disease. Try to limit the amount of time your dog spends in tall grasses during the months of April-November (tick season) and check them regularly when they come inside from a walk. D.R.E.A.M. also recommends spraying your dog with an Eco-Friendly preventative spray such as our Rosemary-Lemon mix to help ward off uninvited visitors. Your vet can recommend various preventative measures, such as sprays, collars and topical products for repelling and killing ticks. You must be careful when using such products if you have cats as they may be deadly to them. Vaccines are also available, although they are controversial due to a high number of side effects. In any case, a vet should be consulted for recommendation of an appropriate method and product. D.R.E.A.M. can’t stress enough that prevention is the key to keeping your dog safe from Lyme Disease. A simple check of your dog before coming in from a romp in the park is a simple and effective way to search out ticks and remove them quickly before they cause any additional issues! I would first make sure that your dogs are interested in swimming. Some dogs just don’t care for water and I wouldn’t force it on them. Start with something like a kiddie pool in the backyard. A smaller pool is a little less intimidating than a bigger pool with deep water. If your dogs enjoy the kiddie pool, that’s a good sign! I would also test them somewhere like the beach (a doggy friendly beach that is) and see how comfortable they are entering the water from the shore. If the dogs don’t show any interest in the water chances are they won’t care for your pool. Never force your dog into a body of water. That can break trust between you and your dog and wreck any chances of your dog actually enjoying a dip in the pool. If your dogs pass the kiddie pool and beach tests, you’re ready to try the pool. Start with one dog inside and one dog outside with you. Have your dog on leash (I also highly recommend a lifejacket for the dog, just incase). Enter the pool (without the dog) and stand by the scamper ramp. When your dog comes near the ramp, give some verbal praise to let your dog know that he is welcome near the ramp. If the dog happily enters the pool on the ramp, you can support his body with your arms until you feel as though the dog is swimming on his own. It might take a few days for your dog to come near the ramp and that is okay. You want your dog to enter the pool on his own and when he’s ready. You want your dog to associate the pool with little stress and instead happiness and a good time. I would also make sure your dogs are supervised when outside. If a dog falls into the pool by accident, they might not be so inclined to head back in any time soon. Neil Sedlacek, owner of Pawstruck Pet Nutrition will be joining DREAM in the City both as a vendor and as a keynote speaker. Neil will be sharing his knowledge on pet nutrition, exploring the connection between what we feed our dogs and their health. He will be discussing the different types of diets available (home cooked, raw, kibble, canned) and their respective merits and drawbacks, as well as what to look for in a commercially prepared diet. Join us for this informative session, and have the opportunity for one on one time with Neil during the day! Growing up with three cats and two dogs, Neil has spent his life surrounded by animals. His first four-legged sidekick was a little grey and white kittenfrom The Winnipeg Humane Society. Who would’ve known that little kitten would cause a major change in direction for Neil. When Neil took his new kitty to the vet for a checkup, he asked “what is the best food I can feed my cat?” Armed with a list of vet-recommended foods, he selected the most expensive brand assuming that cost would equate to quality. Shortly thereafter the pet industry was rocked by a massive recall which affected over 100 brands of cat and dog food. Thousands of pets across North America died from tainted ingredients. What hit home hardest was that every single item on the vet’s list was also on the recall list. Luckily Neil’s kitten wasn’t affected, but from there on out, he decided that he had to educate himself. The more informed he became about the pet food industry, the more he realized that the odds are stacked against the consumer. Conflicting information, misinformation, and massive marketing campaigns all work to undo even the best intentions. After four years of research and countless consultations with industry insiders, Neil now owns and operates Pawstruck Pet Nutrition, a business committed entirely to providing pet parents with a selection of the best food available for their cats and dogs. Everything we do is focused towards the well being of cats and dogs. Every line of food stocked at Pawstruck is researched to determine if the diet is species appropriate, the nature of the preservatives used, the source of the ingredients, and the company’s history of recalls. “If there is anything we don’t like about a food, we simply will not sell it,” Neil states proudly. Of his many rules set when selecting what lines to carry, the most important is that he will only sell food that he is willing to feed to his four-legged family. Visit DREAM in the City: Manitoba Canine Expo on Saturday, June 22nd from 11:00am to 4:00pm, located at Four Points Sheraton South (2935 Pembina Hwy), where Neil will be among five keynote speakers, including Asmara Polcyn! More information at www.dreamrescue.ca.